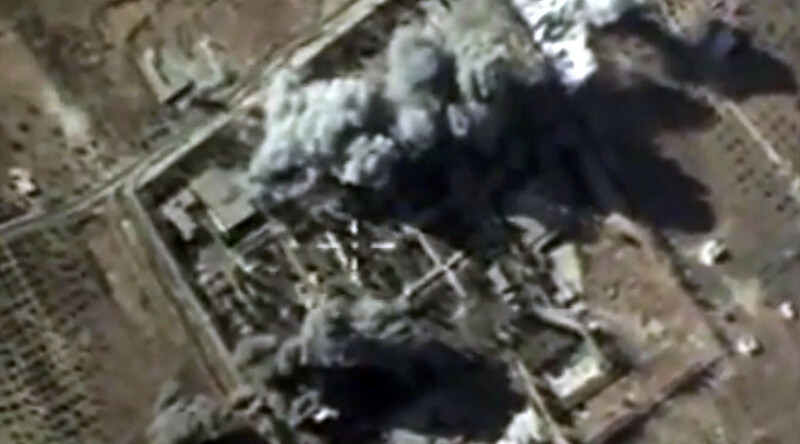 Russian airstrikes have torched more than 1,000 tankers taking stolen crude oil to Islamic State refineries. This blow against the jihadists comes as the Russian Air Force has hit 472 terrorist targets in two days in Syria, making 141 sorties. All Russian aircraft have successfully returned to the Khmeimim airbase near Latakia, Major General Igor Konashenkov, spokesman for the Russian Defense Ministry, said in a daily briefing. In the last two days, Russian warplanes have been conducting active supplemental reconnaissance, inflicting pinpoint airstrikes on newly exposed targets, he added. Russian airplanes have destroyed over 1,000 ISIS tankers with crude oil in the last five days, Konashenkov added. Sukhoi Su-34 bombers also hit a terrorist-controlled oil refinery some 50 kilometers south of Raqqa, the unrecognized capital of the Islamic State terrorists. Russia began counterterrorist operation in Syria on September 30, after Moscow received an official request from Syrian President Bashar Assad. Initially, the military operation was conducted by a task force of more than 50 aircraft and helicopters, including the Sukhoi Su-34 and Su-24M bombers, Su-25 attack aircraft, Su-30SM fighters and Mil Mi-8 and Mi-24 helicopters. Last week, a decision was made to bolster the strike group with 37 new planes, including long-range aircraft carrying out sorties from Russian airfields. Russia’s Caspian Flotilla ships also delivered two massive cruise missile strikes on ISIS targets in Syria using Kalibr NK ship-born cruise missiles, on October 7 and on November 20. A Russian submarine operating in the Mediterranean also delivered missile strike on ISIS, also using Kalibr cruise missiles. Probably the most impressive airstrikes were delivered by Russian strategic bombers, which used long-range strategic cruise missiles with conventional warheads, together with huge payloads of bombs dropped on Islamic State’s installations on the Syrian territory. On November 17, groups of Tupolev Tu-95 (Bear), Tu-22 (Blinder) and Tu-160 (Blackjack) long-range bombers took off from Russian airfields and returned to base after striking the jihadists in Syria. The decision to augment operation in Syria was taken after the Russian security service, the FSB, reported to President Vladimir Putin that the Russian passenger plane that crashed over Egypt’s Sinai was destroyed by a terrorist bomb. President Putin has vowed to find and punish the culprits behind the Sinai plane attack. “Our military work in Syria must not only continue. It must be strengthened in such a way so that the terrorists will understand that retribution is inevitable,” he said. Russian Air Force pilots heading for sorties against Islamic State in Syria have been sending emotional messages to their targets, writing “For Paris” and “For our people” on the sides of the high explosive bombs. In a recent interview to China’s Phoenix TV Channel, Syrian President Bashar Assad said that Russian airstrikes have turned the tide of the war and the Syrian army is now gaining ground at the expense of the terrorists’ positions. “After the participation of the Russian Air Force in fighting terrorism, the situation has improved in a very good way, and now I can say that the army is advancing on nearly every front,” the Syrian president said.